“Wait a minute did I take my meds?” This is a question I often ask even if my pill box, mobile application, or friend says I have. Anxiety, nervousness, fear, and due diligence keep me on track to continue to the best of my ability to take my medications faithfully. For me the process of taking my three medications everyday at 9 am is an experience both with and without emotion. Every time I swallow my pills, I am reminded that HIV is living inside me. According to the CDC, one in four people living with HIV have achieved viral suppression. In other words, three out of four people living with HIV in the United States have either not connected to care or do not adhere to their medication to achieve viral suppression (meaning they have a very low level of HIV in your blood). And while that doesn’t mean I’m cured, by lowering the amount of virus in my body with medicines can keep me healthy, I am able to live longer, and significantly reduce chances of passing HIV on to others. To ensure that I have a great future is the motivating factor behind me staying focused on taking my medication as prescribed. I am proud that to I’m able to maintain my undetectable viral load while increasing my CD4 count/percentage. Seeing those lab results helps to show improvement and reward my diligence of staying on track. Many people may be surprised when I use rewards to treat my success of staying adherent. Giving myself a pat on the back in the form of something that I enjoy gives me a goal to work toward. I call myself a “cheatatarian,” because I tend to often sneak out of my vegetarian diet. My love for chicken sandwiches and seafood is ridiculous; therefore, when I stay adherent without any issues for the month I reward myself by going to my favorite restaurant and having some of those foods (in moderation of course)! A good physical, mental, spiritual, and organizational balance also helps me stay adherent to my HIV meds. Even with my busy schedule running Pozlifeofpatrick , going to school, and managing my professional duties, I always make personal quiet time. That “quiet time” might be playing my favorite game, training for my upcoming marathon, and video chatting with a friend or mentor. And while these activities aren’t necessarily “quiet”, the silence comes in being able to separate out the stressors of the blog, school, and work. This helps me slow down and take the time to focus on my medications. Tools like pillboxes and mobile applications can also help to remind people to take their medications. Personally, I use Care4Today which alerts me to take my meds and helps me chart my adherence. When I am out of town, it reminds me on east coast time (and even asks me to change the time zone). But the feature I find most helpful, is that it notifies providers or family members if I have not taken my medication. There are many online tools and applications like Care4Today,including pill monitor , Thebody.com’s personal reminder service , and RxmindMe that have similar functions. All can be helpful for people who need a reminder or that will check in with a support person when/if you miss a day. Offline, I take extra care to ensure that I have my HIV medication located in my bag that I take everywhere (in a nice discreet carrier). This helps me just in case if I am in a rush and totaly forget about my medications. Community Educational Training on PrEP April 22nd! The National Minority AIDS Council (NMAC) will host a community education training on Pre-Exposure Prophylaxis (PrEP) this April 22, 2014 from 9am-4:30pm at Washington, DC’s DENIM. We’ll provide the most current and accurate information about PrEP, its efficacy, and how it can be an important tool to help young gay men stay HIV-negative. As new infections continue to rise among young gay men of color, we’ll discuss the unique opportunity PrEP presents for young gay, bisexual, and same-gender loving men. These trainings will also allow participants to engage with PrEP educational videos and cultivate skills to better implement and/or replicate the educational videos for a particular community. So bringing in 2014 there will be many of our loved ones, friends, family, colleagues, and strangers who will be ready to begin their New Year Resolutions in hopes of completing them all by the end of the year. Let’s be honest though, who ever completes every single New Years’ Resolutions? This year I plan to do something different that I think will be successful and I invite you all to do the same. I often tell people that my HIV diagnosis two years ago involved me going through a sort of metamorphosis. During this process I evolved as a person, on very physical, emotional, and spiritual levels that were all for good. I saw things more clearly and made a point to go forward with any dreams I had. Can anyone relate? As an 18 year old in high school I wanted to do it all. From an officer in the United States Coast Guard, a professional tennis player, entertainer, author, a business owner, and married to the most perfect partner with the most phenomenal family. I honestly wanted to have it all. As time went on and my dream of not making it in the military and my tennis lacking success, I began not to day dream as much about those potentials. Days that were once spent always day dreaming about my potential future became replaced with more “realistic ideas,” that were more fitting of survival in this world. When I was diagnosed with HIV my eyes flashed before my eyes. Like I talk about in one of my first videos I could have easily not have opted to test for HIV. By not testing my plan was to remain in denial for the rest of my life. Due to this life-changing event I made a choice to look at all of my dreams again and find ways to make them happen. How is this relevant many of you may ask? Well it is simple. As Brian Litrell says, “Shoot for the moon. Even if you miss, you’ll land among the stars.” I looked at ways I can give back to my community (advocating and speaking out about different things that negatively affect it). Although there are policies that prevent me from serving in the military there is hope, and we should definitely continue to pressure Congress and the Department of Defense in allowing individuals living with HIV to serve their country. I also started playing a tennis league and also starting to look for opportunities like using YouTube for my video blogging, singing, and other projects like the MTV documentary to entertain individuals from around the world. In 2014 I will also be focusing time on my book and creating a line of products I hope you all will enjoy. I think it is important that we all reach out for our dreams and wants, no matter what they are. Illnesses or even failure should not keep us from fighting what we want. If we pray on our dreams, continue to work on them, and have affirmations then they will happen. Affirmations are very important and Dr. Harra explains this very well in her Huffington Post Article. Even if you are completing them at 50% that is better than never thinking you can. 1. Be there for others because there is always room to do more in this department. Even by giving a friend a hug, a text during the day saying you are thinking of them, a nice thank you message to your boss (even if they are incompetent), and even saying congratulations or liking a comment of a rival are ways you can be there for others. Volunteering your time or even donating to an AIDS Service Organization (ASO) or Community Based Organization (CBO) can be a way to give back. A database of such organizations can be found here. 2. Patching up issues with adversaries. This is something that is very hard for me. This will be tough for me because I may forget about the past but never forget, which can affect my actions. We should learn how to forgive people for what they do and say. No one is perfect so apologies are definitely fitting. Our egos can be huge barriers at times where reconciliation can take place. 3. Personal Growth can take place is so many different forms. This can be traveling more, taking more vacations, learning a new skill, making new friends, soul searching, and even getting to a place where you can be more open about your HIV status. Personal growth can also include things professionally. There is always room for self-improvement and we should always look at ways to better ourselves. These three simple things can reach literally every goal people make each year. I also think that to be able to accomplish these goals we have to have more realistic expectations. A perfect example is how in the first of the year gyms see an increase of activity that soon tapers off by February/March. By easing into to being physically active and going to the gym on a more consistent basis you start of small with goals like going at least 3 times a week for an hour or so, and then increasing it weekly with an additional day until you are going at a frequency that balances out in your everyday life. Writing my book has seriously resulted in nothing ever happening past a few sentences a quarter; however, now I will dedicate a few minutes out of the day to brainstorm and write a few things. The following month I will increase my writing to something more consistent and realistic to completing by the end of the year. Fixing interpersonal issues can take place with exes, ex-friends, lack of a father-son relationship, etc. They may not be enemies but I think that working on improving communication and ending conflicts helps to relieve stress and drama in one’s life. In 2014 will you work on reaching the moon by having reasonable expectations and progress that will take place over time? Or will you rush into something head on, burn out, and give up halfway through? Again HIV does not mean we cannot accomplish our dreams, so we must make sure that we don’t give up if we hit a brick wall. Breaking through that wall and overcoming our fears and anxieties about such possibilities will result in us having success on some level. In this New Year and beyond it is important to simply do what is best for you. Also, keeping in mind that this also includes doing what is needed to manage your HIV and all other outside sources that may influence it. If anyone has issues with you or the healthier choices you are making to better yourself, then be the fabulous person you are and keep on strutting into the future! So I know many of you have wondered where I’ve been. Well, after a year phenomenal year of amazing events and opportunities that has opened up for PozLifeofPatrick and me. These opportunities would not have happened without others seeing my potential and giving me a chance. On December 18, 2012 I created the blog to chronicle my life living with HIV and to provide opportunities for others to lend their voices. Being open with my status allows me to help educate others, break down stigma, and break the silence that so many of my positive brothers and sisters live in. Many living with HIV lay in silence because of the fear of stigma and discrimination based off of their status. I have worked very hard and seen success in my mission to decrease stigma and increase understanding around this virus that affects so many. On the other end of the very sharp double-edged sword I continue to see a lack of understanding and openness to HIV, even more prevalent in my dating life. Call me strange or too young for love, but throughout this year I helplessly made myself vulnerable in an effort to try to find a significant person to be in my life. As I approach a 2014 I can report and say that at this moment in time I am very much single; however, my priorities have changed. By being able to start my new career in the non-profit sector is where everything started. I was able to interact with many individuals through community HIV outreach, education, and testing. Also, working with NMAC with their Youth Initiative to End HIV/AIDS in America, and its HIV-positive Leadership Working Group of their National HIV Health Literacy and Wellness Initiative. This year I was also given the opportunity featured alongside another fabulous HIV advocate, Guy Anthony on Blackmenrise.org where we talk about in more detail about our lives. 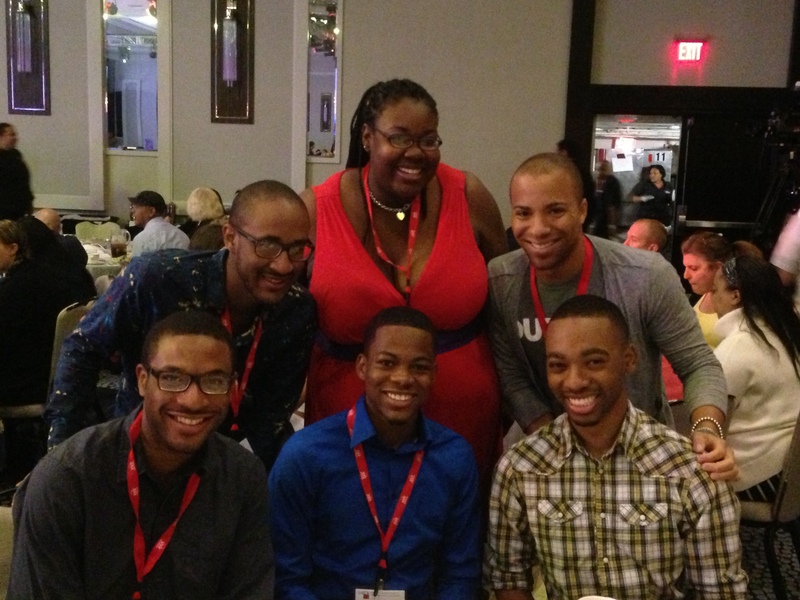 Through NMAC’s Youth Initiative I was able to travel to New Orleans, Louisiana for USCA 2013. There I learned more about HIV and those who are affected by it, networked with so many different individuals and organizations, moderated a discussion on storytelling and HIV, made new allies/friends, and overall took away an amazing invaluable and indescribable experience. Throughout this year I was also able to be brought on as the Testing Coordinator to The Fredericksburg Area HIV/AIDS Support Services (FAHASS) where with the help of a dedicated prevention team helped to test, diagnose, and link more individuals to care then we ever have. With being given a special grant called CAPUS, we will be able to reach more affected populations to educate, test, and link any individual who is HIV-positive into care. documentary may not have been rainbows and butterflies for me, but it gives me a stage to continue the dialogue of what it is like to live with HIV and deal with the struggle to get out of the stages of grief and guilt. Looking back now I can honestly say that I am light years away from that time period in my life. Other highlights of my year was running The Marine Corps Marathon and Anthem Richmond Marathon back-to-back, and helping to raise almost $20,000 for The Grassroots Project’s Team Grassroots. Also, working with ACCESS AIDS in the Hampton Roads region to help further the discussion that needed to take place to people of color. There are many things that I can rant on about but I already feel like folks may think that I am being narcissistic; however, this is more about showing people that if I can do this in one year then why can’t you, a community, or a nation. 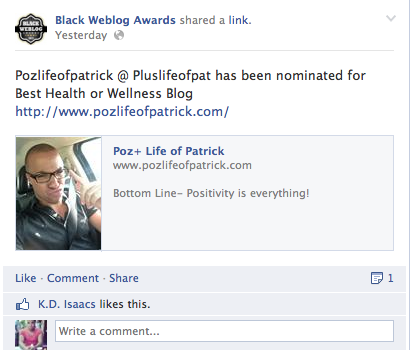 I have said it before but I am serious about making pozlifeofpatrick more about others in 2014. I started the process of having my live show, PozLifeLive, where I bring on others to share their stories, experiences, and work for the world. Also, by opening up my blog up for others to share it gives the opportunity to have an even greater experience when you visit my website or channel. Video on Dating advice and guide (including tips) on how to navigate muddy waters for people living with HIV.